On our sheet set manager it shows that the drawings are locked..even though they aren’t..it says that there may be a network problem..or the program ended during that particular drawing..how do I refresh this so it shows it is not locked? Well I've never encountered this problem before, but you may want to check to see if the SSMSHEETSTATUS variable is set to 2 and maybe see if the setting the SSMPOLLTIME to a shorter time period helps. The default setting for the poll time is 60 seconds to see if the file has been updated. If you having network issues reducing the SSMPOLLTIME may cause longer delays when working in files. You may also see if the .dwl file that is created when a file is open still exists and if deleting the file unlocks the file (although I suspect this won't work). Some people want the invert of a pipe labeled at the inside edge of a structure. I placed a vba routine on the Intermittent Block or Style Of The Day (05-26-08 date) that moves the pipe from the center of the structure to the inside edge so you don't have to do it manually (if that's what you currently do). This could be added to a pipe rule so it could be done at the time rules are applied. The pipes will go back to the center of the structure if the structure is moved or the rotation changed, in that case you would have to reperform the routine. It currently only does on pipe at a time, but could be modified to do all of the pipes in a drawing or all pipes attached to a structure. The program should only work in 2008, but the references could be updated for 2009 or a previous version. I don't have access to a copy of 2009, so I can't currently update it for the current version. AngleFromXAxis allows you to get the angle of two points in Autocad rather easily. PolarPoint allows you to enter a starting point, angle and distance to easily find a point along a line. IntersectWith allows you to take an object in Autocad and see if another object intersects with it. This would have been handy to know when I did my laterals program (may also be found on the Intermittent Block or Style Of The Day site). You can see if they naturally intersect or extend either or both objects to see if they intersect. There is no good way to find if 2 sets of 2 points intersect from the resulting two lines. You either have to enter the formulas or create temporary lines and see if they intersect. We are currently using civil 3D 08 sp2. Most users are new to the software and currently rely on a lisp routine to create grading plans in vanilla cad. The lisp routine reads the attribute of the start point block then allows you to pick a second point and add a slope. Problem is all the grading slopes and elevations are just dumb text. So if anything changes then they have to run the lsp routine again for all locations that are to be revised. I’ve tried explaining we can do a similar thing with feature lines. They seem to think it is much quicker to stick with the old method because once the feature lines have been created you still have to go back and apply surface and feature line labels. So the question buried in all this is how would you go about creating a routine that allows you to create the feature line and add labels at the same time. It is difficult to try to teach old dogs new tricks. Unfortunately the Civil 3D API doesn't expose the feature lines enough to be useful, this means that I don't think it would be possible in 2008 to create a routine that you are requesting. I could be wrong, but from what I have read it's not possible. I think you'll have to go another route to persuade them. I'd go with the quality control route. It doesn't sound like users in question are creating surfaces and only using the blocks with elevation to grade from. While I'm sure the system works for them, I imagine they aren't perfect. For about 2 years I did earthwork quantity takeoffs for a general engineering contractor in Southern California and it always seemed like an elevation or more was off. I was hand digitizing the plans, so some of them were my error, but other spots were from errors on the drafter's/designer's part. The only way I would have found those errors in the plans was by looking at the surface in 3D and examining the surface (my employer never seemed to trust the Engineer's numbers). How are they checking their work? It sounds like they have to check every label or recreate every label. With a surface that task would be reduced and help live up to your company's tag line on the home page. Description:I want to create a polar array in a dynamic block. The normal array command allows polar/rectangular types of arrays, but the polar array parameter set in the block authoring palette does not provide this flexibility. It only allows rectangular array definitions. Please instruct me on how I might create a polar array action in a dynamic block. Thanks for the question. I think you are out of luck trying to get a polar array action using Dynamic blocks. You weren't specific on what you are trying to do. If it's not too many objects you are arraying you could possibly use visibility states to show the objects and a rotate parameter to space the objects. If that doesn't work for you I think you will have to go the programming route. I have a personal goal to post once a week on the blog. This week I haven't come across anything that screamed "I might forget this and need to post it on my blog"; so in attempt to get something to post here I'm looking to play "Stump the Chump", me being the chump and you being the stumpers. So if you are having a hard time with something in Civil 3D and want a chump to stump send me your Civil 3D conundrum at fredbobchris@gmail.com and I will try to answer it here on this blog. There may be a better way, this is how I do it. Click on the pictures for bigger sizes. 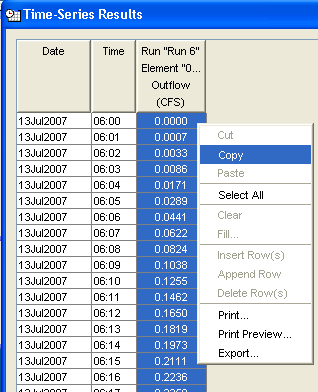 Select the column for the outflow cfs and copy it. Open up the LinkTest.csv sample link file that comes with HydroCAD. Rename and place the file where you want it to be, modify the file as indicated below. If you want to add additional comments, just precede them with // as shown in the sample file. Once in HydroCAD drag a link into the workspace and right click on it and choose edit. Change the Link Type to Import hydrograph file and then from the File tab browse to the file to add it to the link. Make sure to select the outflow you want to use. When you double click on the link it should show you approximately the same hydrograph that was in HEC-HMS. This year the Civil 3D 2009 30 day trial is available for download. So much for "ask not what your country can do for you - ask what you can do for your country." I guess I'm assuming Uncle Sam is picking up the tab for the disability. I don't see the logic from going from paying for the property at market price to stealing is the same thing. 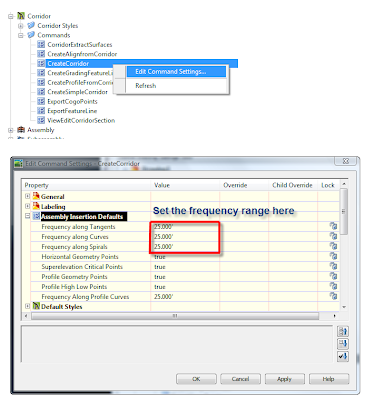 You can set the default corridor frequency by going to the command settings for corridors and changing the value there.